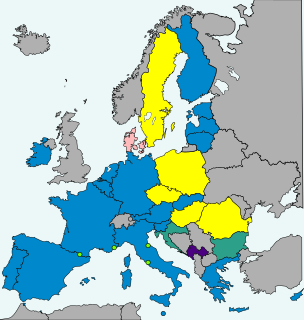 The Treaty of Accession 2005 is an agreement between the member states of European Union and Bulgaria and Romania. It entered into force on 1 January 2007. 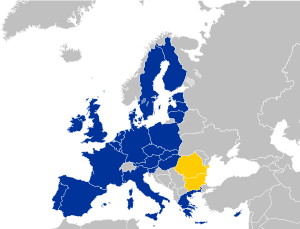 The Treaty arranged accession of Bulgaria and Romania to the EU and amended earlier Treaties of the European Union. As such it is an integral part of the constitutional basis of the European Union. Bulgaria committed to switching its currency, the lev, to the euro upon its joining the European Union in 2007, as stated in its EU accession treaty. The Commissioner for Enlargement and European Neighbourhood Policy is the member of the European Commission in charge of overseeing the accession process of prospective new member states and relations with those bordering the European Union (EU). The present Commissioner, as of May 2015, is Johannes Hahn. Accession of Montenegro to the European Union (EU) is on the current agenda for future enlargement of the EU. The enlargement of the eurozone is an ongoing process within the European Union (EU). All member states of the European Union, except Denmark and the United Kingdom which negotiated opt-outs from the provisions, are obliged to adopt the euro as their sole currency once they meet the criteria, which include: complying with the debt and deficit criteria outlined by the Stability and Growth Pact, keeping inflation and long-term governmental interest rates below certain reference values, stabilising their currency's exchange rate versus the euro by participating in the European Exchange Rate Mechanism, and ensuring that their national laws comply with the ECB statute, ESCB statute and articles 130+131 of the Treaty on the Functioning of the European Union. 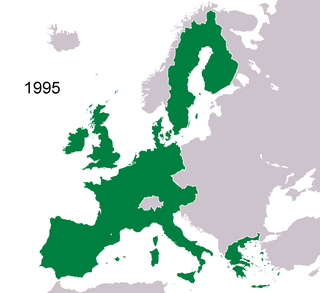 The obligation for EU member states to adopt the euro was first outlined by article 109.1j of the Maastricht Treaty of 1992, which became binding on all new member states by the terms of their treaties of accession. 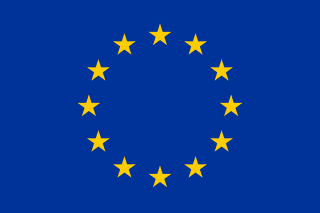 The Sixth European Parliament was the sixth five-year term of the elected European Parliament. It began on Tuesday 20 July 2004 in Strasbourg following the 2004 elections and ended after the 2009 elections. Croatia's currency, the kuna, has used the euro as its main reference since its creation in 1994, and a long-held policy of the Croatian National Bank has been to keep the kuna's exchange rate with the euro within a relatively stable range.